United Colours of Bingo Review | £20 FREE NO Deposit! When you join United Colours of Bingo, you will receive a fab Welcome Bonus: £20 FREE, no deposit necessary! What better way to get started and get the hang of things?! Plus, once you've joined the site, you will receive a 250% bonus upon your first deposit of just £10. Enjoy this one stop shop, packed with amazing bingo, slots, bonuses, jackpots and loads of chances to win – there's something for everyone! United Colours of Bingo offers loads of 75, 80 and 90 ball bingo, as well as a variety of slots, casino games and scratch cards. There are bingo jackpots up to £200 daily and FREE games every month. Enjoy top slots, such as Lucky Devil, Honey Bees and Queen of Legends, as well as European and Classic Blackjack, Roulette, keno and more! Pre-buy your tickets and win big everyday! United Colours of Bingo is always finding ways to reward their players. As a member of the site, you can get loyalty points simply by wagering. Once you've collected some points, you can trade them in for cash! 100 loyalty points = £1 cash, and you can trade up to 2,000 points weekly! The more points you earn, the higher your loyalty level. A bet of £2 on bingo and £6 on slots will get you 1 point each. Start wagering and start earning your free cash today! United Colours of Bingo is packed with some amazing promos just for you! Share the bingo fun and invite your friends to join the site to get a spectacular bonus equivalent to 100% of their initial deposit. PLUS, claim 10% of all deposits your friends make in their first 60 days at United Colours of Bingo. Collect Guaranteed cash-back monthly up to £200 when you play slots, and claim a bonus for each deposit you make, getting a 100% bonus on your 5th deposit of the month! You can also play the full house games to DOUBLE your winnings, or spin your favorite slots to claim 20% daily cashback. There is also a daily raffle adventure where you can win a share of a £20,000 bonus. These are just a few of the site's generous promos – you do not want to miss out! Keep playing and keep winning anytime, anywhere!When you sign up you’ll receive a £20 FREE No Deposit required just like the online version. You’ll also get to enjoy some super enticing offers when you play on your mobile device including 900% in bonuses on your first 3 deposits. All you have to do is login to the main site from your mobile device and you can instantly play on the go – no download necessary! The bingo fun never needs to end! 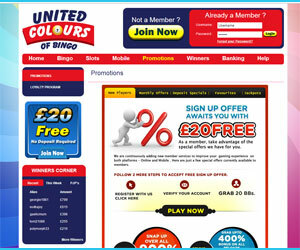 Players may be overwhelmed with the incredible gaming options on United Colours of Bingo’s Mobile Site. There’s an unbelievable selection of 47 different games to choose from and absolutely no download is required!